Once Yama, the god of death, married a woman of earth and started living there. They had a son called Yama Kumar. Yama soon realised that his wife was very cunning. She always quarled with him, so he went back to his kingdom. His wife did not teach Yama Kumar anything so when he grew up he was not able to earn his living. One night, Yama appeared before his son and said that he should learn about medicine. Soon Yama Kumar became a doctor. Yama said , "Every time you see me near a patient , You will know that the patient is going to die. You must refuse to treat that patient." So yama kumar treated only the patients who were going to survive. He became very famous. One day the princess fell ill. Many doctors came from far and wide and tried to cure her, but failed. When Yama Kumar went to see her, he found his father there and realised that the princess is going to die. She is so young and beautiful." Yama replied , "I have to fulfil my duty, but for my sake you will take her after three days." Yama Kumar made a plan to save the princess. When Yama returned, he shouted, "Mother! Father is here, you can meet him." Yama did not want to meet his wife, and on hearing this he was so scared that he ran away without taking the princess. Yama Kumar saved the princess's life. 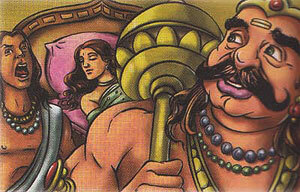 The king was so happy that he got his daughter married to Yama Kumar.